This is a rather strong statement. Epicureanism, says Mises, inaugurated the spiritual, moral and intellectual emancipation of mankind. There are several other passages in his books where he mentions this philosophy in a very favourable light, but without ever explaining in details why. And although a lot of attention has been devoted to the influence of Aristotle, Aquinas, the Scholastics, the French liberals and others on Austrian ideas, as far as I know, nobody has ever paid attention to Epicurus. Now, why would Mises make such a claim in relation to a philosophy that has been so reviled for 2000 years? Stacks of new books devoted to Plato, Aristotle and other philosophers of Antiquity appear every year. But if you go to a university library, you will usually find a shelf or two containing books on Epicureanism, and that’s for all those that were published in the past hundred years. Epicureanism has been largely forgotten. And when it is mentioned, it is usually the distorted view that has been propagated since Antiquity that is being repeated. Epicureanism is said to be the philosophy of “Eat, drink and be merry because tomorrow you die.” An “Epicure” is a depraved and irresponsible individual only concerned with bodily pleasures. In Austrian terms, we would say he has very high time preference. I even read in an article that the unbridled hedonism of the Epicureans played an important role in the transformation of ancient Rome from a republic to an empire. There is not a shred of historical evidence that they had that kind of influence, and Epicureans were not a licentious lot anyway. On the contrary, their goal was tranquility of mind. For them, it is true, all pleasures were good, including those of the body. But they tried to attain happiness by planning their lives in the long term in the most rational way possible. Let me briefly give you some general information. Epicurus was born in 341 B.C., only six years after Plato’s death. He was 18 when Alexander the Great died. This event conventionally separates the classical Greece of independent city-states from the Hellenistic period, when Alexander’s generals and their dynasties ruled vast kingdoms in the former Persian Empire. He set up his school in a Garden in the outskirt of Athens. There is very little that survived from his many books. But fortunately, the work of his Roman disciple Lucretius, who lived in the first century B.C.E., De Rerum Natura, or On the Nature of Things, was rediscovered in the 15th century. Through this work, Epicureanism had a major influence on the development of science in the following centuries. Epicurus had borrowed and refined the atomic hypothesis of earlier philosophers, and De Rerum Natura was studied and discussed by most scientists and philosophers of the West. The physics of Epicureanism, which explains that worlds spontaneously emerge from the interaction of millions of tiny particles, still looks amazingly modern. It is the only scientific view coming out of the Ancient World that one can still read today and find relevant. Those influenced by Epicureanism include Hobbes, Mandeville, Hume, Locke, Smith, and many of the British moralists up to the 19th century. They not only discussed the Atomic theory, but Epicurean ethics, his views on the origin of society, on religion, his evolutionary account of life, and other aspects of his philosophy. To me, Epicureanism is the closest thing to a libertarian philosophy that you can find in Antiquity. Plato, Aristotle, the Stoics, were all statists to various degrees, glorified political involvement, and devised political programs for their audiences of rich and well-connected aristocrats. Epicurus focused on the individual search for happiness, counselled not to get involved in politics because of the personal trouble it brings, and thought that politics was irrelevant. His school included women and slaves. He had no political program to offer and one can find no concept of collective virtues or order or justice in his teachings. On the contrary, the search for happiness implied that individuals should be as free as possible to plan their lives. To him, as one of his sayings goes “natural justice is a pledge guaranteeing mutual advantage, to prevent one from harming others and to keep oneself from being harmed. In a letter to William Short sent in 1819, Thomas Jefferson writes “I too am an Epicurean. 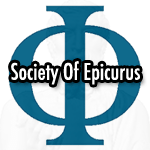 I consider the genuine (not the imputed) doctrines of Epicurus as containing everything rational in moral philosophy which Greece and Rome have left us.” But what’s also interesting is that our friends the Marxists also thought Epicurus was a great philosopher. Marx himself did his doctoral dissertation on the differences between the atomism of Epicurus and his forerunner Democritus. Most books on Epicureanism published in France in the 20th century were written by Marxists. (Well, I suppose you could say that of most books published in France on any topics in the 20th century…!) I have a booklet on Lucretius at home published in France in the 1950s in a collection called Les classiques du peuple – The classics of the people. In the Acknowledgement section, the author thanks all the Soviet specialists of Epicureanism and materialism for any original insight that might appear in the book. Epicurus had reacted against the Platonic concepts of Reason with a capital R, the Good, the Beautiful, Duty, and other absolute concepts existing in themselves in some supernatural world. For Epicurus, what is moral is what brings pleasures to individuals in a context where there is no social strife. The Epicurean wise man will keep the covenant and not harm others not because he wishes to comply with some moral injunction being imposed from above, but simply because that’s the best way to pursue his happiness and keep his tranquility of mind. Mises says the same thing when he repeats his adherence to utilitarianism, which looks upon the rules of morality not as absolutes, but as means for attaining an individual’s desired ends through social cooperation. In his book Socialism, he writes: “The ethical valuation ‘good’ and ‘evil’ can be applied only in respect of ends towards which action strives. As Epicurus said “Vice without injurious consequences would not be vice. Since action is never its own end, but rather the means to an end, we call an action good or evil only in respect of the consequences of the action.” To Mises, Epicureanism inaugurated the emancipation of mankind precisely because it led to utilitarianism. The very basis of praxeology, the logic of human action, rests on Epicurean concepts. Epicurus says that nature compels all living beings to search for pleasures and to avoid pain. When they reach their goal, they are in a state of contentment and rest that we can call happiness or tranquility of mind. Ataraxia is the term used by Epicurus to describe a perfect state of contentment, free or all uneasiness. In an article on the implications of human action, Gene Callahan discusses this and asserts that Mises’ insight into the relationship of praxeology to any possible supreme being is quite original, at least as far as he knows. Well, in fact, this insight is straight out of Epicureanism. Epicurus declared that since Gods were perfect and completely contented, they could not be involved in any way in human affairs. It was silly to be afraid of them, and useless to try to propitiate them. For this of course, he was suspected of being an atheist, and this is a major reason why he has been so vilified by Christian writers for centuries. There are several groups of neo-Epicureans that one can find on the Web today. Several years ago, I joined a discussion list on Epicureanism and discovered to my amazement that most of the participants were libertarians, many of whom Randians or former Randians. One can find articles on the Internet discussing similarities between Objectivism and Epicureanism, and how Ayn Rand has been influenced by Epicurus.